Original Editors -HannahAnderson and Millie Ware from Bellarmine University's Pathophysiology of Complex Patient Problems project. Serotonin syndrome occurs when you take medications that cause high levels of the chemical serotonin to accumulate in your body. Serotonin is a chemical needed for your nerve cells and brain to function. Vomiting, sleep, temperature regulation, appetite, mood, regulation of BP, and the perception of pain are functions that involve brain serotonergic neurons. It may also be associated or involved in conditions such as migraine headaches and anxiety. The proper amount of serotonin helps improve our qulaity of life, but too much serotonin causes symptoms that range from mild, moderate, and potentially life-threatening symptoms. Serotonin syndrome most often occurs when two drugs that affect the body's level of serotonin are taken together at the same time. The drugs cause too much serotonin to be released or to remain in the brain area. Serotonin Syndrome is on the rise, however information on it is limited. According to an article in the New England Journal of Medicine, in 2002 there were over 7,000 cases of Serotonin Syndrome and of those 93 cases were fatal. Approximately 10% of the adult population in the U.S. reports having Depression. In 2011, the U.S. Center of Disease Control finished a study about the number of Americans taking Anti-depressants. The CDC found that one in every ten people over the age of 12 years old is taking an antidepressant. According to the Migraine Research Foundation, every one of four homes in the U.S. has someone who experiences migraines. The American Migraine Foundation states that 36 million Americans suffer from migraines. Physician's will use either Hunter's Toxicity Criteria or Sternbach's Criteria to diagnose Serotonin Syndrome. Serotonin syndrome most often occurs when two drugs that affect the body's level of serotonin are taken together at the same time. The drugs cause too much serotonin to be released or to remain in the brain area. It is most likely to occur when you first start or increase the medicine. Although it's possible that taking just one drug that increases serotonin levels can cause serotonin syndrome in susceptible individuals, it occurs most often when you combine certain medications. For example, serotonin syndrome may occur if you take an antidepressant with a migraine medication. A common cause of serotonin syndrome is intentional overdose of antidepressant medications. Treatment for Serotonin Syndrome greatly depends on the severity of the patient's symptoms. Often times in mild cases discontinuing the problem medications will be enough to stop the symptoms within a short period of time. It is recommended that these patients still remain under close watch for at least 24 hours. Muscle relaxants. Benzodiazepines, such as diazepam (Valium) or lorazepam (Ativan), can help control agitation, seizures and muscle stiffness. 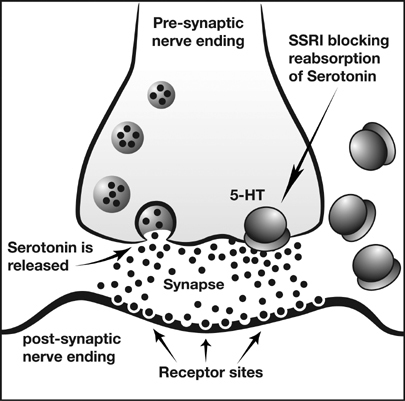 Serotonin-production blocking agents. If other treatments aren't working, medications such as cyproheptadine can help by blocking serotonin production. Oxygen and intravenous (IV) fluids. Breathing oxygen through a mask helps maintain normal oxygen levels in your blood, and IV fluids are used to treat dehydration and fever. Drugs that control heart rate and blood pressure. These may include esmolol (Brevibloc) or nitroprusside (Nitropress), to reduce a high heart rate or high blood pressure. If your blood pressure is too low, your doctor may give you phenylephrine (Neo-Synephrine) or epinephrine. A breathing tube and machine and medication to paralyse your muscles. These may be necessary if you have a high fever. Milder forms of serotonin syndrome usually go away within 24 hours of stopping medications that increase serotonin, and by taking medications to block the effects of serotonin already in your system if they're needed. However, symptoms of serotonin syndrome caused by some antidepressants could take several weeks to go away completely. These medications remain in your system longer than do other medications that can cause serotonin syndrome. Exercise: According to research, exercise can cause an increase in serotonin levels similar to those caused by medication. In addition, exercise can be beneficial to mood and energy level. Talk Therapy: Cognitive-behavioral therapy and interpersonal therapy are strategies for patients to help manage their Depression. Serotonin Syndrome is unlikely to be the cause of the symptoms the patient is experiencing if they have not taken a Selective Serotonin Reuptake Inhibitor (SSRI), Serotonin-norepinephrine Reuptake Inhibitor (SNRI), or a Triptan within the last month. Anticholinergic Overdose: This can be caused by use of insecticides. Symptoms include dry/hot skin, absent bowel sounds, and normal reflexes. Malignant Hyperthermia: This is related to the patient being under anesthesia and occurs acutely. Hyporeflexia is a common symptom. Neuroleptic Malignant Syndrome: NMS is a reaction to a dopamine antagonist drug. This is most commonly confused with Serotonin Syndrome because similar symptoms (ex. Hyperthermia, changes in mental status). However, symptoms of this syndrome that are different from Serotonin Syndrome are bradykinesia and muscle rigidity. Also, there is a gradual onset over a many days, whereas symptoms of Serotonin Syndrome quickly progress. Alnwick GM. Physical Therapy. Misdiagnosis of serotonin syndrome as fibromyalgia and the role of physical therapists. PTJ 2008; 88:757-765. Sener S, Yamanel L, Comert B. A fatal case of severe serotonin syndrome accompanied by moclobemide and paroxetine overdose. IJCCM 2005; 9:173-175. Wilson L, Rooney T, Baugh RF, Millington B. Recognition and management of perioperative serotonin syndrome. AJO 2012; 33:319-321. ↑ 1.0 1.1 1.2 1.3 1.4 PubMed Health. Serotonin Syndrome. http://www.ncbi.nlm.nih.gov/pubmedhealth/PMH0004531/ (accessed 6 March 2013). ↑ 2.0 2.1 2.2 2.3 2.4 2.5 Mayo Clinic. Serotonin Syndrome. http://www.mayoclinic.com/health/serotonin-syndrome/DS00860 (accessed 6 March 2013). ↑ Utox Update. Serotonin Syndrome. http://uuhsc.utah.edu/poison/healthpros/utox/vol4_no4.pdf (accessed 6 March 2013). ↑ Boyer EW, Shannon M. Current concepts the serotonin syndrome. NEJM 2005; 352: 1112-1121. http://toxicology.ucsd.edu/art%203%20serotonin%20syndrome.pdf (accessed 8 March 2013). ↑ Centers for Disease Control and Prevention. CDC Features: An Estimated 1 in 10 U.S. Adults Report Depression. http://www.cdc.gov/features/dsdepression/ (accessed 8 March 2013). ↑ Centers for Disease Control and Prevention. NCHS Data Brief - Number 76, October 2011. http://www.cdc.gov/nchs/data/databriefs/db76.htm (accessed 8 March 2013). ↑ Migraine Research Foundation. About Migraine. http://www.migraineresearchfoundation.org/about-migraine.html (accessed 8 March 2011). ↑ American Migraine Foundation. About Migraine. http://www.americanmigrainefoundation.org/about-migraine/ (accessed 8 March 2011). ↑ National Headache Foundation. Press Kits – Facts About Triptans. http://www.headaches.org/press/NHF_Press_Kits/Press_Kits_-_Facts_About_Triptans (accessed 8 March 2013). ↑ Wilson L, Rooney T, Baugh RF, Millington B. Recognition and management of perioperative serotonin syndrome. AJO 2012; 33:319-321. http://ck8zf4yc8t.search.serialssolutions.com.libproxy.bellarmine.edu/?genre=article&isbn=&issn=1532818X&title=American+Journal+Of+Otolaryngology&volume=33&issue=3&date=20120501&atitle=Recognition+and+management+of+perioperative+serotonin+syndrome.&aulast=Wilson+L&spage=319&sid=EBSCO:MEDLINE&pid= (accessed 8 March 2013). ↑ Neurotic Physiology. Back to Basics 3: Depression post 5, The Serotonin Theory of Depression. http://scientopia.org/blogs/scicurious/2010/08/25/back-to-basics-3-depression-post-5-the-serotonin-theory-of-depression/ (accessed 8 March 2013). ↑ 12.0 12.1 Robinson DS. Serotonin Syndrome. PPJ 2006; 13:36-38. http://www.primarypsychiatry.com/aspx/articledetail.aspx?articleid=554 (accessed 8 March 2013). ↑ Alnwick GM. Physical Therapy. Misdiagnosis of serotonin syndrome as fibromyalgia and the role of physical therapists. PTJ 2008; 88:757-765. http://ptjournal.apta.org/content/88/6/757.full#ref-1 (accessed 8 March 2013). ↑ WebMD. A Holistic Approach to Treating Depression. http://www.webmd.com/depression/features/holistic-medicine (accessed 8 March 2013). ↑ WebMD. Alternative Treatments for Migraines and Headaches. http://www.webmd.com/balance/nontraditional-headache-treatments (accessed 8 March 2013).